The effect of extract of Delonix regia on corrosion inhibition of mild steel in aqueous 0.1 M sulphuric acid was investigated by potentiodynamic polarization (PDP), scanning electron microscopy (SEM) and Fourier transformed infra-red spectroscopy (FTIR) techniques. The inhibition efficiency is found to increase with increase in concentration of the extract. Polarization measurement indicates that Delonix regia acts as a mixed type. The inhibition is assumed to occur via physical adsorption of inhibitor molecules on metal surface, which obeys Langmuir adsorption isotherm. The negative values of ?Gads show that adsorption of inhibitor on surface of the mild steel is spontaneous. Results from the Gas Chromatography – Mass Spectroscopy (GCMS) analysis indicated that DRLE has some phytochemicals with hetero atom(s) and π electrons in their aromatic or long carbon chain which may have facilitated the transfer of charge from the inhibitor’s molecule to the charged metal surface, hence inhibiting the corrosion process of the metal. SEM and FTIR studies confirmed the adsorption of inhibitor molecules on mild steel surface. The focus on the protection of metals against corrosion is on the increase because of enormous losses of natural resources and finances associated with corrosion process [1-3]. Apart from economic viewpoint, corrosion control is important also from environmental and aesthetical angle . Options that in use for preventing the corrosion of metal are painting, anodic/cathodic protection, electroplating and the use of corrosion inhibitors . Extract of plants and other natural products have also been utilized for the protection of metals against corrosion [3-6]. Researchers generally agreed that most of these plant extracts are green corrosion inhibitors because they are biodegradable, less toxic and do not contain heavy metals . In the light of these, several plants extracts have been investigated and their corrosion inhibition properties are often attributed to its phytochemical constituents [4-7]. We have reported recently the adsorption characteristics and corrosion inhibition ability of Delonix regia for mild steel in sulphuric acid using weight loss . Results obtained revealed that the Delonix regia was found to be good inhibitor and the inhibitor was adsorbed on metal surface by spontaneous physical adsorption mechanism. In the present investigation, the corrosion inhibiting behavior of Delonix regia was investigated on mild steel in sulphuric acid media at 303 and 333 K using electrochemical, Fourier Transform Infra – red (FTIR) and scanning electron microscope (SEM) techniques. GCMS was used to identify the active constituents of plant extract involved in corrosion inhibition. Materials used for the study were mild steel sheet of composition (wt %, as determined by quantiometric method) Fe% (98.048) C% (0.348), Si% (0.221), Mn% (0.745), P% (0.032), S% (0.035), Cr% (0.033), Mo% (0.017), Ni% (0.128), Cu%(0.316), Co% (0.013), Al% (0.001), V% (0.001), Sn% (0.027), As% (0.014), Ca% (0.001), Sb% (0.017) and Te% (0.003). The sheet was mechanically pressed cut into different coupons, each of dimension, 5 × 4 × 0.11 cm. Each coupon was degreased by washing with ethanol, cleaned with acetone and allowed to dry in the air before preservation in a desiccator. All reagents used for the study were analar grade and double distilled water was used for their preparation. Concentration of H2SO4 used for weight loss and electrochemical studies was 0.1 M.
Preparation of plant extract: Leaves of Delonix regia were obtained in July 2016 from the premises of Gray’s International College in Igabi LGA, Kaduna, Kaduna State of Nigeria. The leaves were washed with water; shade dried, grounded and soaked in a solution of ethanol for 48 hours. After 48 hours, the sample was cooled and filtered. The filtrate was further subjected to evaporation at 338K (65ºC) in other to ensure the sample free of ethanol. The plant extract obtained was used in preparing different concentrations of the extract by dissolving 0.1, 0.2, 0.3, 0.4 and 0.5 g of the extract in 250 ml of 0.1 M H2SO4 for the gravimetric analysis. GC-MS analysis: GC-MS analysis was carried out on a GC Clarus 500 Perkin Elmer system comprising of a AOC-20i auto-sampler and gas chromatograph interfaced to a mass spectrometer (GC-MS) instrument employing the following conditions: column Elite-1 fused silica capillary column (30 × 0.25 mm ID × 1 μM df, composed of 100% dimethylpoly diloxane), operating in electron impact mode at 70 eV; helium (99.999%) was used as carrier gas at a constant flow of 1 ml / min and an injection volume of 0.5 μI was employed (split ratio of 10:1) injector temperature 250ºC; ion-source temperature of 280ºC. The oven temperature was programmed from 110ºC (isothermal for 2 min), with an increase of 10ºC/min, to 200ºC, then 5°C/min to 280ºC, ending with a 9 min isothermal at 280ºC. Mass spectra were taken at 70 eV; a scan interval of 0.5 seconds and fragments from 40 to 450 Da. Total GC running time was 36 min. Interpretation on mass spectrum GC-MS was conducted using the database of National Institute Standard and Technology (NIST) Abuja, having more than 62,000 patterns. The spectrum of the unknown component was compared with the spectrum of the known components stored in the NIST library. The name, molecular weight and structure of the components of the test materials were ascertained. The concentrations of the identified compounds were determined through area and height normalization. Potentiodynamic polarisation: The potentiodynamic currentpotential curves were recorded by changing the electrode potential, Ecorr automatically with a scan rate of 0.33 mV s-1 from a low potential of -800 to -300 mV Stanadard Calomel Electrode (SCE). Before each run, the working electrode was immersed in the test solution for 30 minutes until a steady state was achieved. The linear Tafel segments of the anodic and cathodic curves obtained were extrapolated to corrosion potential to obtain the corrosion current densities (icorr). where i0corr and iCorr are the uninhibited and inhibited corrosion current densities, respectively. Where, F is the Faraday constant (96485 C.mole-1.S-1), D is the density of metal (g.cm-3), n is the number of electrons involved in the reaction (in moles of electrons per mole of metal corroded), Mw is the molecular weight (g.mole-1) and icorr is the corrosion current density (A.cm-2). FTIR analysis: FTIR (Fourier Transform Infra-red) analysis of the Delonix regia leaves extract (DRLE) and those of the corrosion products (in the absence and presence of the inhibitor) were carried out using Cary-630 Agilent Fourier transform infra-red spectrophotometer. The analysis was carried out by scanning the sample through a wave number range of 650 to 4000 cm-1. Scanning electron microscopy studies: A scanning electron microscope (SEM) model JSM-5600 LV, was used to analyze the morphology of the mild steel surface without and with inhibitor added. The sample was mounted on a metal stub and sputtered with gold in order to make the sample conductive, and the images were taken at an accelerating voltage of 10 kV using different magnifications. The results obtained from potentiodynamic polarization (anodic and cathodic) curves for the corrosion of mild steel in 0.1 M H2SO4 solution in the presence and absence of the various concentration of the inhibitor is presented in Figure 1. The electrochemical parameters derived from these plots are presented in Table 1. The electrode potential (Ecorr) and corrosion current densities (icorr) were found to decrease on addition of the Delonix regia leaves extract (DRLE) to 0.1 M H2SO4. On increasing the inhibitor concentration, values were shifted more negatively. This proposes that Delonix regia leaves extract behaves predominantly as cathodic inhibitor. The inhibition efficiency results of the inhibitor were calculated from the corrosion current values according to equation 4 and the values are presented in Table 1. From the values, it can be seen that the inhibition efficiency showed a steady increase following increased inhibitor concentration from 0.1 g/l to 0.5 g/l. This increase as compared to the blank value indicates a reduction in mild steel corrosion rate through the formation of adsorbed protective film against corrosion attack at the metal/electrolyte interface . The values of corrosion rate obtained shows that the rate of corrosion decreases with increase in inhibitor concentration which is as expected . Figure 1. Potentiodynamic polarization curves for the mild steel in 0.1 M H2SO4 in the absence and presence of different concentrations of DRLE. Table 1. Polarization parameters obtained at various concentration of inhibitor (DRLE) on mild steel in acidic (0.1 M H2SO4) media. From equation 5, the plots of log(C/θ) versus logC should yield straight lines provided the assumptions establishing the Langmuir adsorption isotherm are valid. 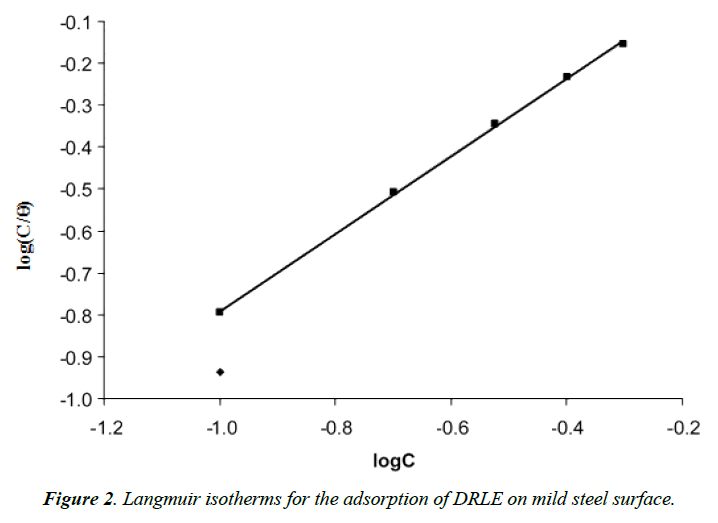 Figure 2 show the Langmuir isotherms for the adsorption of DRLE on mild steel surface. The adsorption parameter deduced from the isotherm are presented in Table 2. From the results obtained, it can be seen that the slopes and R2 values for the Langmuir plots are very close to unity indicating strong adherence of the adsorption data to the Langmuir adsorption model. Figure 2. Langmuir isotherms for the adsorption of DRLE on mild steel surface. Table 2. Langmuir parameters for the adsorption of DRLE on mild steel surface at 303 K in 0.1 M H2SO4. Where, T=temperature and R=Molar constant. Calculated vales of the free energy are also presented in Table 2. From the results obtained, the free energies are negatively less than the threshold value of -40 kJ/mol required for the mechanism of chemical adsorption . Generally, values of ΔG0ads between 0 and -20 kJ/mol, are consistent with the mechanism of charge transfer from charged inhibitor’s molecules to charged metal surface. Therefore, the adsorption of DRLE on mild steel surface is spontaneous and supports the mechanism of physical adsorption [16-18]. Figures 3 and 4 show the FTIR spectrum of Delonix regia leaves extract and the corrosion product respectively. Wave numbers and intensities of adsorption, in terms of the height of the different peaks, deduced from the FTIR spectrum of DRLE and the corrosion product as well as the assignment of vibration type and functional groups are presented in Tables 3 and 4 respectively. From the results obtained, it can be seen that the FTIR of DRLE consists of C – X stretching of alkyl halides at 657 cm-1 and 666 cm-1, C-H waging of alkyl halides at 1171 cm-1, C-H rocking of alkanes at 726 cm-1 and 1378 cm-1 and C-H oop of aromatic at 840 cm-1. C-N stretching of aliphatic amines also occurred at 1039 cm-1 and 1073 cm-1. There is also C-C stretching ring of aromatic at 1451 cm-1. C-H bending of alkanes at 1460 cm-1 and N-O stretching of nitro compounds at 1510 cm-1. N-H bending of amines at 1613 cm-1, 1620 cm-1 and 1639 cm-1. There is C=C stretching of alkene at 1657 cm-1 and C=O stretching of saturated aliphatic aldehyde at 1737 cm- 1. In addition, there are O-H stretching of carboxylic acids at 2855 cm-1, 2926 cm-1 and 2956 cm-1. The O-H stretch phenolic alcohol at 3385 cm-1 and 3410 cm-1. Figure 3. 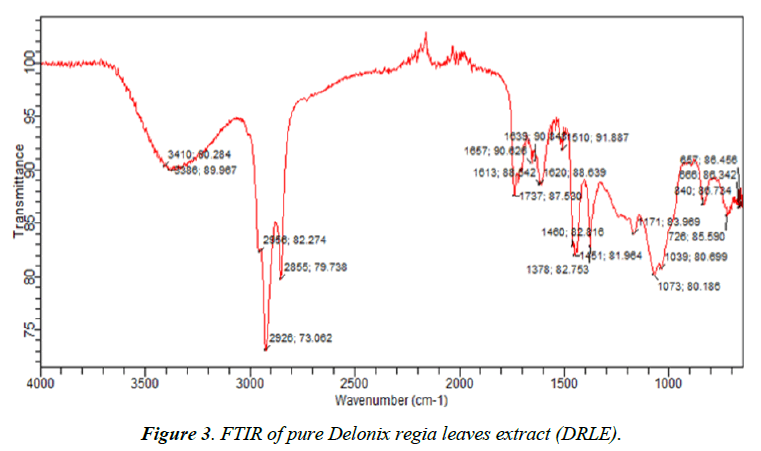 FTIR of pure Delonix regia leaves extract (DRLE). Figure 4. FTIR of corrosion product of mild steel by 0.1 M H2SO4 in DRLE. Table 3. Wave and intensity of delonix regia leaves extract. Table 4. Wave number and Intensities of FTIR of corrosion product of DRLE as inhibitor. In the FTIR of the corrosion product of mild steel in the DRLE, it was found out that the C-H bending of aromatic at 840 cm-1 has been shifted to 745 cm-1, the C-C stretch of 1451 cm-1 in aromatic ring has been shifted to1423 cm-1. The N-H bending at 1613 cm-1, 1620 cm-1 and 1639 cm-1 shifted to 1579 cm-1 and there was also a shift in the C=O stretching of saturated aliphatic aldehyde at 1737 cm-1 to 1687 cm-1. There was also a shift from O-H stretching at 2855 cm-1, 2926 cm-1 and 2956 cm-1 to 2969 cm-1. The shifts in the frequencies of vibration indicate that there is interaction between the inhibitor and the metal surface. The following frequencies of vibration were absent in the FTIR spectrum of corrosion product of mild steel in DRLE: O-H bending of phenolic alcohol at 3386 cm-1, C-N stretching of aliphatic amines at 1039 cm-1, C-H rocking of alkene at 1378 cm-1, C-H rocking of alkane at 726 cm-1, C-H waging of alkyl halide at 1171 cm-1 and C-H bending of alkyl at 1460 cm-1. This shows that these functional groups were used in adsorbing the inhibitor to the metal surface. Equally important is the formation of new frequencies of C-O stretch at 1197 cm-1 and C≡C stretch at 2114 cm-1. This shows the inhibitor formed new bonds with the mild steel metal surface which appreciably provide inhibition of corrosion of the mild steel. The surface morphology of mild steel in solutions of H2SO4 was studied using scanning electron microscopy. Figure 5a shows the scanning electron micrograph of mild steel while Figure 5b the scanning electron micrograph of mild steel in the absence of an inhibitor. But in the presence of Delonix regia as an inhibitor (Figure 5c), it can be seen that it can be seen that the damaging effect is greatly reduced and the surface is relatively smooth probably due to the formation of protective coverage by the inhibitor. This was as a result of the leaves extract forming multiple layers with various functional groups on the mild steel. Figure 5. SEM analysis for (a) the pure mild steel (b) the mild steel in H2SO4 (c) the mild steel in H2SO4 and in the presence of DRLE. Figure 6 shows the GC-MS spectrum of ethanol extract of Delonix regia. The retention time, molecular formula, mass peaks, fragmentation peaks and concentrations of major phytochemicals obtained from reliable spectral library are presented in Table 5. From the results presented, it is evident that the DRLE has some phytochemicals which have hetero atom(s) or π electrons in their aromatic or long carbon chain. This may have facilitated the transfer of charge from the inhibitor’s molecule to the charged metal surface, hence inhibiting the corrosion process of the metal. Figure 6. GCMS of Delonix regia leaves extract (DRLE). Table 5. Phytochemicals identified in the ethanol extract of the leaves of DRLE by GC-MS.
From the results and findings of the study, the following conclusions were drawn. (i) Ethanol extract of Delonix regia leaves is an adsorption inhibitor for the corrosion of mild steel in acidic (0.1 M H2SO4) medium. (ii) The adsorption of ethanol extract of Delonix regia is spontaneous and occurred according to the mechanism of physical adsorption (ΔGoads values were lower than threshold value of -40 KJ/mol). (iii) Adsorption of inhibitor on surface of the mild steel is spontaneous. (iv) Potentiodynamic polarization measurements show that Delonix regia acts as a mixed type inhibitor. (v) Langmuir adsorption isotherm best described the adsorption characteristics of DRLE on the surface of mild steel. (vi) The SEM images of inhibited strips reveal the likely formation of a protective film. 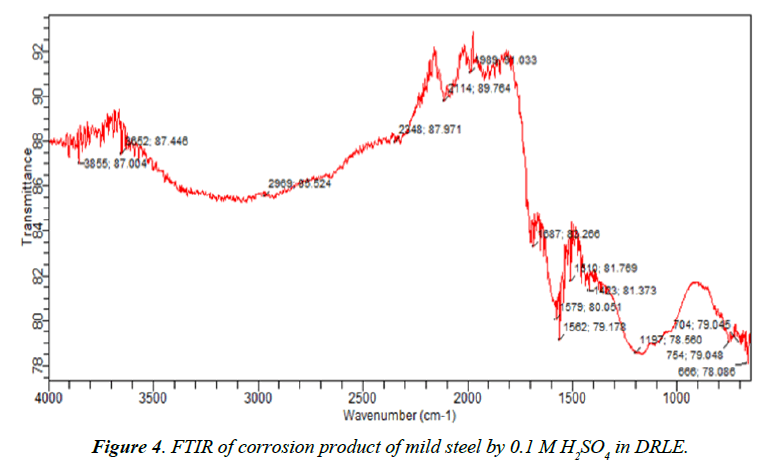 (vii) The corrosion product of mild steel is not IR active but in the presence of ethanol extract of Delonix regia leaves, the IR spectrum of the corrosion product confirmed that these extracts inhibited the corrosion of mild steel by been adsorbed on the surface of mild steel and that there is interaction between the inhibitor and the surface. Ameh PO, Eddy NO. Commiphora pedunculata gum as a green inhibitor for the corrosion of aluminium alloy in 0.1 M HCl. Res Chem Intermed. 2014;40(8):2641-9. Noor EA. Potential of aqueous extract of Hibiscus sabdariffa leaves for inhibiting the corrosion of aluminum in alkaline solutions. J Appl Electrochem. 2009;39:1465–75. Oguzie EE. Corrosion inhibitive effect and adsorption behaviour of Hibiscus sabdariffa extract on mild steel in acidic media. Portugaliae Electrochimica Acta. 2008;26:303-14. Khamis E, Al Andis N. Herbs as new type of green inhibitors for acid corrosion of steel. Materwiss Werksttech. 2002;33(9):550-4. Eddy NO. Adsorption and inhibitive properties of ethanol extract of Garcinia kola and Cola nitida for the corrosion of mild steel in H2SO4. Pigment and Resin Technology. 2010;39(6):347-53. Noor EA. Potential of aqueous extract of Hibiscus sabdariffa leaves for inhibiting the corrosion of aluminum in alkaline solutions. J Appl Electrochem. 2009;39:1465-75. Kolo AM, Ahmed A, Ajanaku IK. Adsorption and inhibitive properties of Delonix regia leaves for the corrosion of mild steel in H2SO4. International Journal of Novel Research in Physics, Chemistry and Mathematics.2016;3(3):1-12. Ameh PO, Ukoha P, Eddy NO. Experimental and quantum chemical studies on the corrosion inhibition potential of phthalic acid for mild steel in 0.1 M H2SO4. Chem Sci J. 2015;6(100):1-8. Vracarand LM, Drazic DM. Adsorption and corrosion inhibitive properties of some organic molecules on iron electrode in sulfuric acid. Corrosion Science. 2002;44:1669 -81. Eddy NO, Ameh P, Gimba CE, et al. GCMS studies on Anogessus Leocarpus (AL) gum and their corrosion inhibition potentials for mild steel in 0.1 M HCl. Int J Electrochem Sci. 2011;6:5815-29. Eddy NO, Ameh P, Gimba EC, et al. Chemical information from GCMS of Ficus platyphylla gum and its corrosion inhibition potential for mild steel in 0.1 M HCl. Int J Electrochem Sci. 2012;7:5677-91. Eddy NO, Odiongenyi AO, Ameh PO, et al. 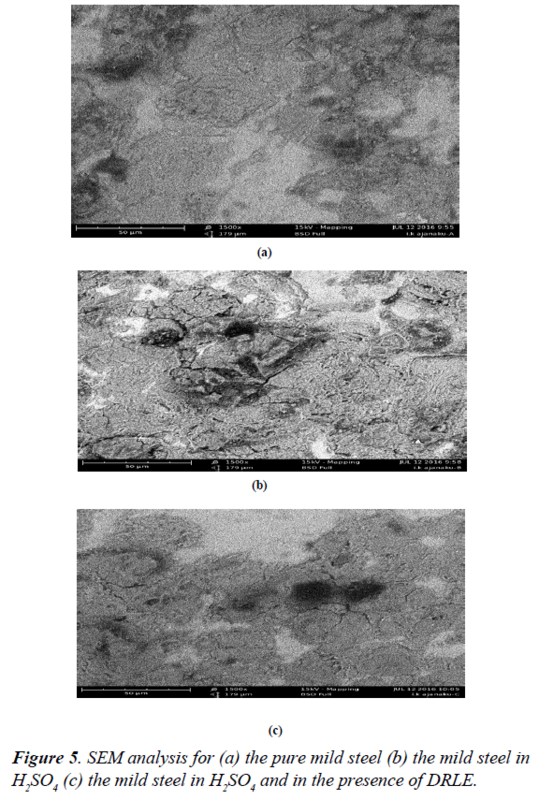 Corrosion inhibition potential of Daniella Oliverri gum exudate for mild steel in acidic medium. Int J Electrochem Sci. 2012;7:7425-39. El-Awardy AA, Abd-El-Nabey BA, Aziz SG. Kinetic thermodynamic and adsorption isotherms analyses for the inhibition of the acid corrosion of steel by cyclic and open chain amines. J Electrochem Soc. 1992;139(8):2149-54. Gojic M. Adsorption and corrosion inhibitive properties of some organic molecules on iron electrode in sulfuric acid. Corrosion Science. 2002;43:919-29. Khadom AA, Yaro AS, Musa AY, et al. Corrosion inhibition of copper-nickel alloy: Experimental and theoretical studies. J Korean Chem Soc. 2012;56(4):406-15. Negm NA, Elkholy YM, Zahran MK, et al. Corrosion inhibition efficiency and surface activity of benzothiazol-3-ium cationic Schiff base derivatives in hydrochloric acid. Corrosion Science. 2010;10:3523–36. Ameh PO, Odiongenyi AO, Eddy NO. Joint effect of Anogessius Leocarpus Gum (AL Gum) exudate and halide ions on the corrosion of mild steel in 0.1 M HCl. Portugaliae Electrochimica Acta.2012;30(4):235-45.